At Decorators Factory Outlet, drapery hardware is much more than simply the nuts and bolts of a project. Hardware is the mint on the pillow at a fine hotel. Hardware is the difference between gold or silver buttons on a cashmere blazer—an accoutrement small in size, but with incredible aesthetic impact. 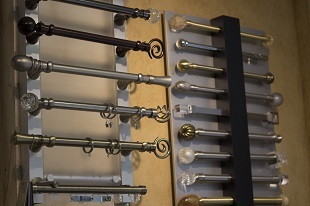 That’s why we offer a huge assortment of drapery hardware and display so many options in our showroom. Whether creative and unique hardware styles are your thing or your client’s, classic designs or hard-to-find items, we carry complete lines from all the top manufacturers. Even if you’ve seen it somewhere else, at Decorators Factory Outlet, we can get it! We have the largest array of hardware on display in the region. Copyright © 2015, Decorators Factory Outlet. All Rights Reserved.